U.S. military forces took control of Iraq within days, but the greater challenge has been to secure a country of broken hearts, bruised pride--and resilient enemies. Risking their lives to save another, Lt. Jeffery Goodman and Lance Cpl. Jorge Sanchez of the 2nd Tank Battalion drag a wounded civilian to safety after he was caught in the midst of battle on the road to Baghdad, Iraq, on April 4, 2003. © 2003 Cheryl Diaz Meyer. All Rights Reserved. Mohammad Hussein, 26, right, is held by his brother, Alla Asir, after he was severely burned by an exploding fuel storage tank that he was looting on April 18, 2003. With no functional police and the country's infrastructure in ruins, Iraqi citizens took to looting all public facilities. Marine Staff Sgt. 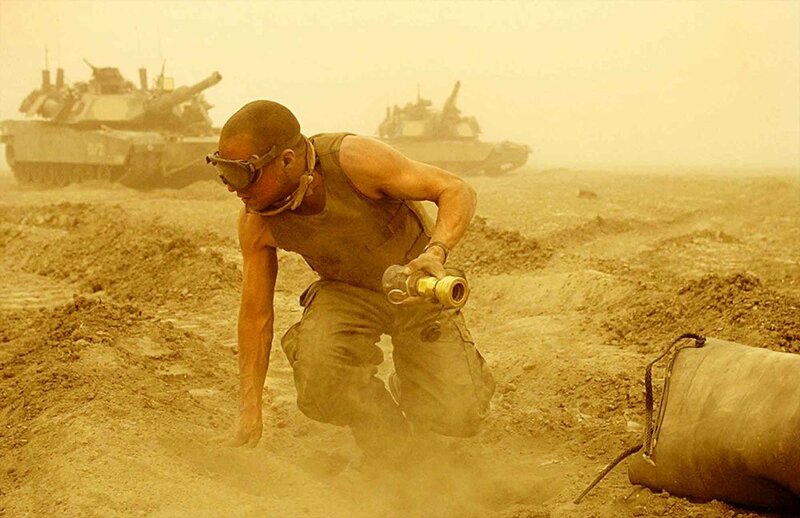 Brian Flaherty of New York, Delta Company of the 2nd Tank Battalion, disconnects a fuel bladder from a tank as a dust storm rages in preparation for an advance to the north of Iraq on March 25, 2003. The Marine's move north has been one of the most aggressive tank road marches in history. A vacant stare, plastic ties and muddy, shoeless feet. In war, everyone is suspect. After a short fire fight in Sayyid Mohammad, these men were rounded up, stripped and interrogated and later released on April 9, 2003. After three weeks and 300-plus miles of speed-and-maneuver warfare, Master Gunnery Sgt. Frank Cordero savors the first letters from his wife, Melissa, on April 7, 2003. "I held that first one for about five minutes...just to smell it and hold it." When Ferasse Jasim's young sister, Shaima, welcomed him home, she screamed in horror to see her brother nearly dead from torture, in Baghdad, Iraq, on April 28, 2003. His skin was burned off his feet and much of his body for having evaded military duty. She tends to him daily watching his strength return, glad for the end of Saddam Hussein's regime and his cruelty. A cloud of dust kicks up as Marines head to the mess hall for breakfast at Camp Coyote in northern Kuwait on March 16, 2003. Over 6000 Marines, seamen and British forces waited in the camp for the U.S.-led strike against Iraq. Overcome with emotion after the remains of their brothers were unearthed at a mass grave in Abu Ghraib Cemetery, Ali Majeed Al Shumary leans on Mohammad Bakar Whathiq as the men grieve in Baghdad, Iraq, on April 25, 2003. Their brothers Walid Majeed Al Shumary and Brer Bakar Whathiq were killed for opposing President Saddam Hussein's regime. Corpses of children lay in a pool of blood inside a minibus at an intersection near Hatif Haiyawi, an area loyal to Saddam Hussein, during the U.S. Marine 2nd Tank Battalion's advance on Baghdad, Iraq, on April 5, 2003. Controlling civilian movement left numerous civilian deaths as Marines responded to suicide bombers, Iraqi soldiers posing as civilians and other ambush tactics. Uniss Mohammad Salman, 10, returns to Al Amtithal Elementary School to a message on the chalkboard from U.S. soldiers--Iraq is free! Al Amtithal was the first school to reopen in Baghdad, Iraq, on April 27, 2003. Of 1200 pupils, only a handful of children returned. Short informal lessons were conducted, but mostly children familiarized themselves with their surroundings. At Baghdad's Abu Ghraib Cemetery, Mohammad Bakar Whathiq lovingly kisses the skull of his brother, Brer Bakar Whathiq, who was killed in 1993 for opposing Saddam Hussein's regime, in Iraq, on April 25, 2003.